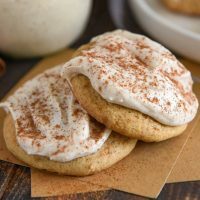 Sweet Potato Cookies with Cinnamon Cream Cheese Frosting: pillowy soft, spiced sweet potato cookies are frosted with a rich, sweet cinnamon cream cheese icing! If you have been looking for the best Sweet Potato Cookie, look no further. These are going to win by a landslide! The Sweet Potato Cookie base is super fluffy, soft and loaded with great sweet potato flavor from Bruce’s Yams. Their canned yams really make this recipe super easy to whip up. You just open the can, drain the syrup and mash them! 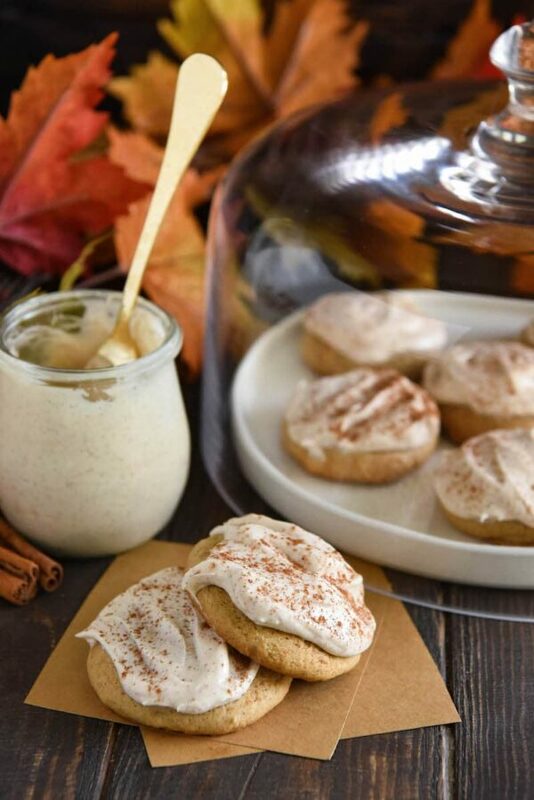 I topped my Sweet Potato Cookies with a super smooth and sweet cinnamon cream cheese frosting that is pure creamy deliciousness. These are heavenly little cookies and I wish you could smell them through the screen! My whole house smelled like fall! I really feel that sweet potatoes are super under utilized in desserts. They are just as good as pumpkin, maybe even better! There are many pumpkin desserts that I like to swap sweet potatoes in place of the pumpkin. To me, sweet potatoes have a milder flavor that lends itself to many more uses. For example, my Sweet Potato Bundt Cream Cheese Cake I make every year! Plus, I always make sure and have a Sweet Potato Pie at Thanksgiving and it’s usually the first one to go!! 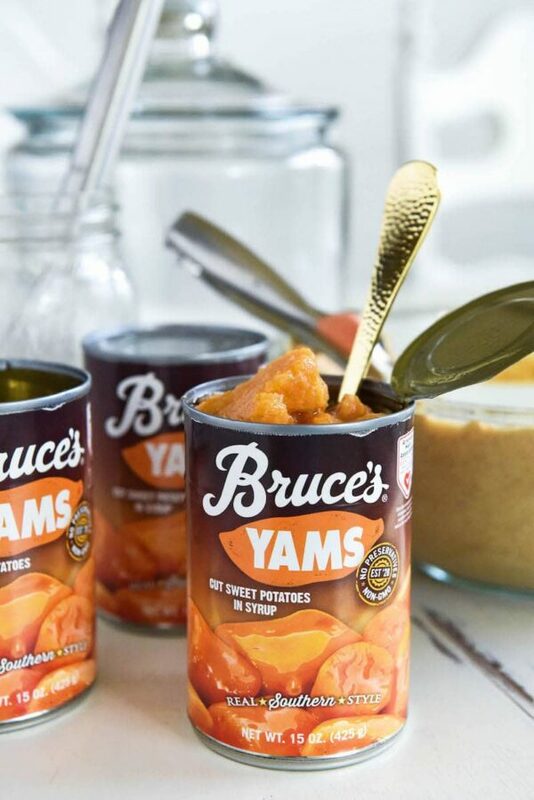 Bruce’s Yams are the number one selling canned sweet potato in the United States. Their sweet potatoes use only the freshest sweet potatoes from nearby farms and are triple-peeled and canned within hours of harvesting. My personal favorite thing about Bruce’s Yams is the simplicity of the ingredients and lack of names I can’t pronounce. In a can of Bruce’s Yams Cut Sweet Potatoes, there are just 3 ingredients: Sweet Potatoes, Water and Sugar. Yup, that’s it!! Bonus: Bruce’s Yams are certified by the American Heart Association! 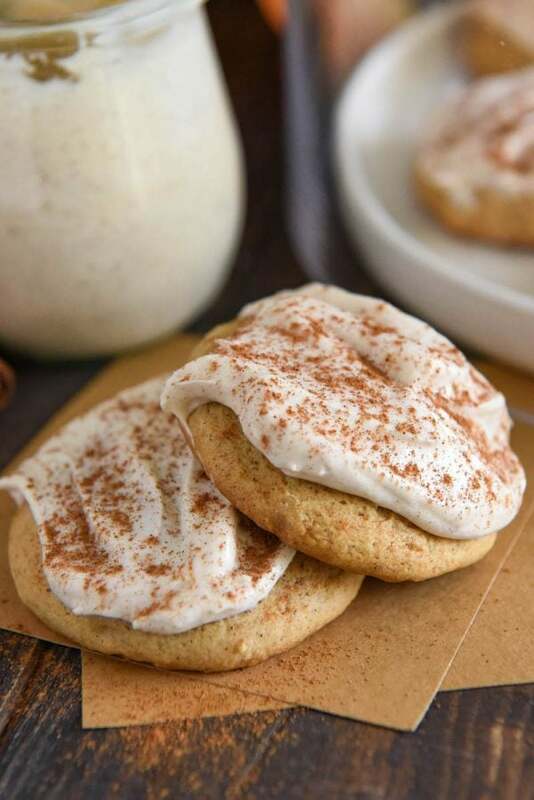 These Sweet Potato Cookies with Cinnamon Cream Cheese Frosting may sound hard to make, but I promise they are very easy. The hardest part is the hour wait while the dough chills in the fridge! 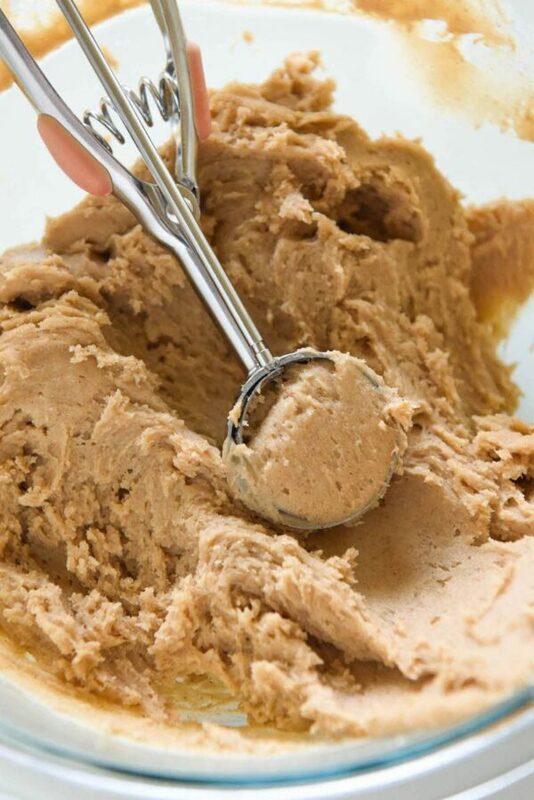 The cookie dough itself uses melted butter and Bruce’s Yams to keep them moist. Then we spice them up with cinnamon, nutmeg and a little vanilla extract. These Sweet Potato Cookies are extra soft and rise up a lot into a perfectly rounded cookie as they bake. Then we load on that Cinnamon Cream Cheese Frosting, right on top, in a big generous thick layer! It is the perfect topping! I can’t wait to hear all of your reviews for these Sweet Potato Cookies with Cinnamon Cream Cheese Frosting! 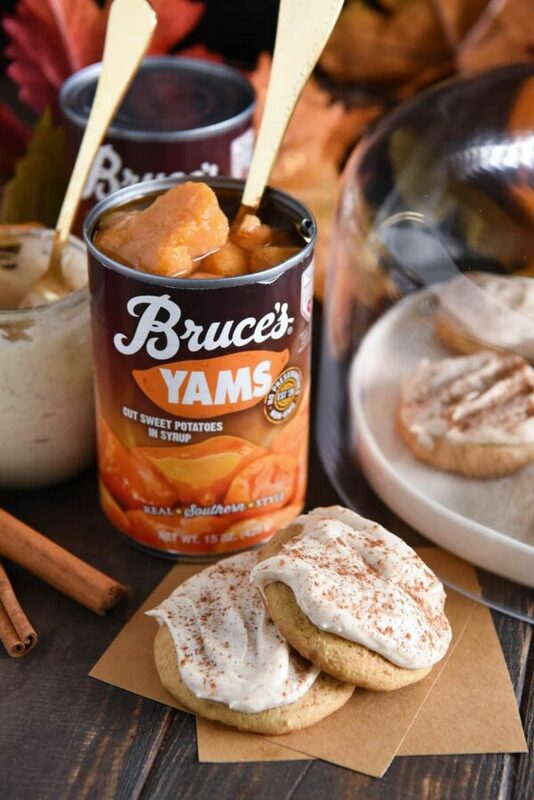 For more great sweet potato desserts, make sure and check out Bruce’s Yams! In a medium sized bowl, whisk together flour, cornstarch, baking powder, baking soda, cinnamon, nutmeg and salt. Set aside. In a large bowl whisk together sweet potatoes, butter and granulated sugar. Add egg and vanilla extract. Beat in flour mixture until well combined. Cover bowl with foil or parchment paper and refrigerate for one hour or overnight. Using a medium cookie scoop, drop dough by onto prepared cookie sheets. Grease the bottom of a flat glass with butter and gently press cookie dough into flat disks about 1/2 inch thick. Bake for 10 to 12 minutes or until tops are set. Transfer to wire racks to cool. For Cinnamon Cream Cheese Frosting: Beat together cream cheese, butter, cinnamon and vanilla until well combined. Add powdered sugar and beat until smooth. Generously frost on top of each cookie and dust with extra cinnamon if desired. Serve immediately and store any leftovers in the refrigerator. I bet these are so sweet and soft! They look amazing ! This sounds like the perfect cookie!! I absolutely love that frosting!! YUM!! I am loving these super soft cookies. And that frosting!! Yum! These Sweet Potato Cookies with Cream Cheese Frosting look AMAZING! I LOVE that cream cheese frosting, but I wonder how they would taste with a homemade marshmallow cream frosting & cinnamon or even with added chopped pecans or soft pre-plumped raisins.? Regardless, I can’t wait to try your recipe as is! I do believe these cookies willl make a wonderful addition to our Thanksgiving menu. These look really good! My kids will surely enjoy these! These cookies look amazing! Love how soft and fluffy they are! Now this is my favorite cookies recipe. This looks amazing! I cannot wait to give it a try. Thank you for sharing this great recipe. YUM! I want to eat this by the spoonful! It looks so good! Do you think these would tase okay with fresh sweet potatoes?